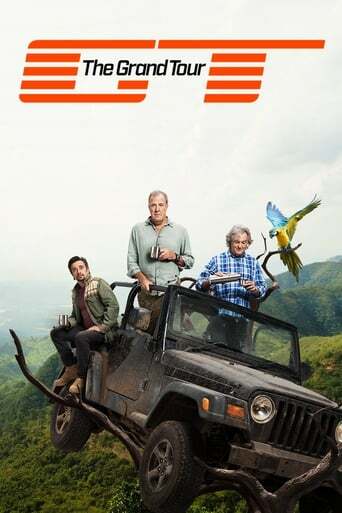 Jeremy Clarkson, Richard Hammond and James May are back with a show about adventure, excitement and friendship... as long as you accept that the people you call friends are also the ones you find extremely annoying. Sometimes it's even a show about cars. Follow them on their global adventure. 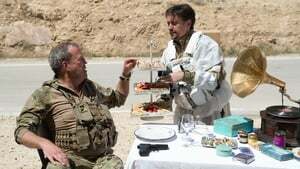 Jeremy Clarkson, Richard Hammond and James May start their brand new car show with hundreds of cars, thousands of people, a fire spitting metal scorpion and a squadron of jets in the California desert, plus three amazing hybrid hypercars and a brilliant BMW. Jeremy Clarkson, Richard Hammond and James May bring the traveling Grand Tour tent to The Cradle of Humankind near Johannesburg in South Africa. In this show, the three hosts are forced to become special forces soldiers with an all action challenge at a top secret training base, deep within Jordan. Also in this episode, Jeremy introduces the 800 horsepower Aston Martin Vulcan to the Grand Tour test track, and James is sent to investigate an unusual form of motorsport called spinning. The travelling tent lands on the quayside in Whitby, England where Jeremy Clarkson, Richard Hammond and James May introduce a modern take on the traditional Italian grand tour featuring an Aston Martin DB11, a Rolls-Royce Dawn and an uninvited guest. Also in this show, Jeremy faces the consequences of a foolish bet and Simon Pegg is the star guest. The studio tent is back in Whitby, England as Jeremy Clarkson introduces an almost impartial test of the Porsche 911 GT3 RS against the BMW M4 GTS, and the three hosts attempt to make cars from sustainable materials. Comedian Jimmy Carr is the celebrity guest. 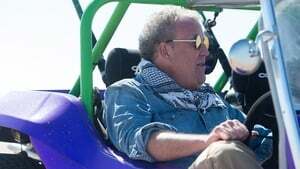 The Grand Tour studio arrives in Rotterdam where Jeremy Clarkson, Richard Hammond and James May introduce a lightweight sport car test featuring the Alfa Romeo 4C Spider, the Mazda MX5 and the Zenos E10 in the stunning landscapes of Morocco. Also in this show, Hammond and May play a traditional board game using cars and Dutch band Golden Earring are the guest stars. The Grand Tour tent is in Kakslauttanen, Finland, deep within the Arctic Circle with a show in which Richard Hammond and Jeremy Clarkson compare the Ford Mustang V8 and the Ford Focus RS, James May recounts the bitter 1960s battle for endurance racing supremacy between Ferrari and Ford, and the presenters run through some ideal Christmas gifts for car fans. 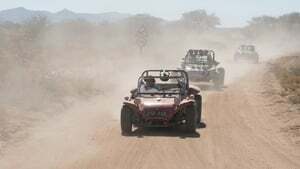 In the first of two special shows, Jeremy Clarkson, Richard Hammond and James May are challenged to complete an epic journey across Namibia in three beach buggies, each built to their personal spec. What starts off as a simple determination to win an argument with their boss turns into an amazing adventure across some of the most incredible desert scenery Africa has to offer. 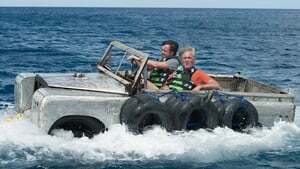 In the second show of a two-part special, Jeremy Clarkson, Richard Hammond and James May are battling across Namibia in a quest to prove that beach buggies are brilliant. Having survived the challenges of the desert, the trio must now brace themselves for even greater hardship involving rough roads, camping, rhino conservation and a rather unusual river crossing. This week, The Grand Tour arrives in Stuttgart, the home of Porsche and Mercedes-Benz. In this show, James May takes the new Honda NSX supercar to the Eboladrome to push its cutting-edge hybrid technology to the limit and Richard Hammond immerses himself in the world of doomsday preppers as he constructs a ‘bugout’ vehicle that will allow him to survive a bleak future of nuclear winters, alien invasions and massed herds of zombies. 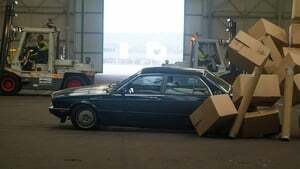 Meanwhile, in a less realistic attempt at engineering, Jeremy Clarkson invents a new kind of fashionable SUV. Also in this show, the hosts attempt to meet the future demands of electric cars by harnessing power from the currently untapped actions of everyday life. 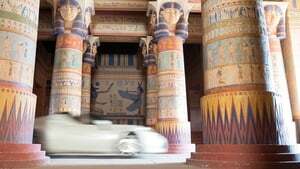 The Grand Tour: Dumb Fight at the O.K. Coral sees the tent travelling to Nashville. Jeremy Clarkson, Richard Hammond and James May introduce their attempt to save the world's coral reefs. In the interests of conservation, the three travel to Barbados and begin an earnest attempt to establish a new reef using only some car bodyshells as a foundation. Their efforts start badly and then get worse, involving inept crane driving, useless boat steering, and an embarrassing moment with a local hotel. Also in this show, Jeremy finally indulges his series-long Alfa Romeo obsession with a test of the new, 500 horsepower Giulia Quadrifoglio. From the shores of Loch Ness in Scotland, Jeremy Clarkson, Richard Hammond and James May introduce their attempts to buy used Maseratis for a bargain price and then use them to tour the drizzle flecked landscapes of the North of France. Also in this programme, Richard takes the Abarth 124 Spider to the Eboladrome, Jeremy comes up with a way to install cutting edge features in an older car, and Olympic cycling champion turned car racer Sir Chris Hoy is invited to try Celebrity Brain Crash. The Grand Tour tent is once again in Loch Ness, Scotland after a monster discovery since the last show. This week, the hosts tour central Europe in a Jaguar F-Pace, a Bentley Bentayga and a Range Rover Autobiography, arguing over which is the best SUV and trying not to giggle at road signs. Also in this show, Jeremy kills preconceptions as he laps the Eboladrome in a Lexus GS F, the hosts examine the point of launch control, and Hollywood legend Tim Burton is invited to play Celebrity Brain Crash. Jeremy Clarkson and James May introduce a battle between their own, personal cars. Jeremy champions the past with his Volkswagen Golf GTI while James makes a case for the future with his electrically powered BMW i3. 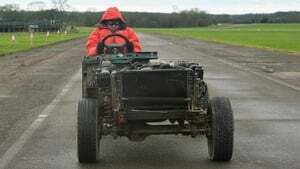 Meanwhile, Richard Hammond is in France learning how to drift a car like a pro, and James is sent to a damp part of England to take part, against his will, in a strange sport called winching. Plus, the recently deceased Bugatti Veyron takes part in a drag race against the current hypercar speed champion, the Porsche 918 Spyder.